Elliott Daingerfield was born in Harper’s Ferry, Virginia on the eve of the Civil War, and his father was taken hostage by John Brown during his famous raid. His family soon thereafter moved to Fayetteville, North Carolina, and Daingerfield was raised there during the War and the era of southern Reconstruction. He began his career as a sign painter but realized that pursuing art as a profession would require his moving north. As a youth in North Carolina, however, Daingerfield first experienced the mystic epiphanies which would play an important role in his life and art. The budding artist moved to New York City in 1880 and apprenticed with artist Walter Satterlee, while studying at the same time in the Art Students League. Within the decade of the ’80’s, Daingerfield began to achieve some success as an artist in NYC, but he maintained contact with his southern roots, keeping a residence in North Carolina throughout his life. In 1884 Daingerfield moved to the Holbein Studios on fifty-fifth street, where he met George Inness. This began a friendship and informal tutelage which would determine the shape of Daingerfield’s art. 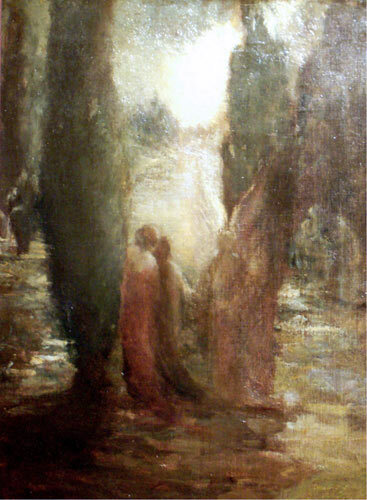 Inness’s interest in Swedish mystic Emmanuel Swedenborg may have fed Daingerfield’s mystic tendencies, and Daingerfield’s adoption of the Barbizon style led to his being dubbed “the American Millet,” an appellation which those who know the work of both artists must consider unfortunate. A more obvious influence upon Daingerfield was that of his contemporary Albert Pinkham Ryder, with whom he also made a personal acquaintance. Daingerfield, like Ryder, combined a Tonalist treatment with a symbolic or mythical subject matter. In the major work of both painters, the subject becomes largely suggested, as though recalled from a dream, and the aesthetic intent of both artists seems mainly to provoke a response in the viewer’s imagination. The symbolic and religious content of Daingerfield’s work became even more pronounced after the death of his wife in 1891. The artist himself died in 1932 in Gainsborough, North Carolina. The largest single collection of Daingerfield’s work can be found in the Morris Museum of Art (Augusta, Georgia). His work can also be found in the permanent collections of the Metropolitan Museum of Art, the National Academy of Design, the Smithsonian American Art Museum, the Brooklyn Museum of Art, the Hickory (N.C.) Museum of Art, the Butler Institute of American Art, the High Museum of Art, the North Carolina Museum of Art, the Minneapolis Institute of Arts, and many others.